Jim McKeeth has a blog post up where he highlights an Android app you can use to verify whether Delphi XE6 Firemonkey apps will run on your Android device. SysCheck was created by Christopher Moeller and is available on the Google Play market. SysCheck reports the CPU type, the OS version, and the various instruction sets that are supported by your Android device. Pretty much all new Android devices have CPUs that support NEON (which is required). Some older Android devices do not have the NEON instruction set and are not able to run Delphi XE5, Delphi XE6, and AppMethod apps. Some of these devices are still sold in international markets. Another requirement is that the Android device have an ARM 7 processor which again almost all new Android devices have at least an ARM7. The one caveat are devices with x86 based CPUs (mainly from Intel) which will not run Firemonkey apps unless the device also has an ARM7 instruction emulator (which some devices have). This can make it pretty confusing which is why SysCheck is a good app to load up on any Android device and test it for compatibility. 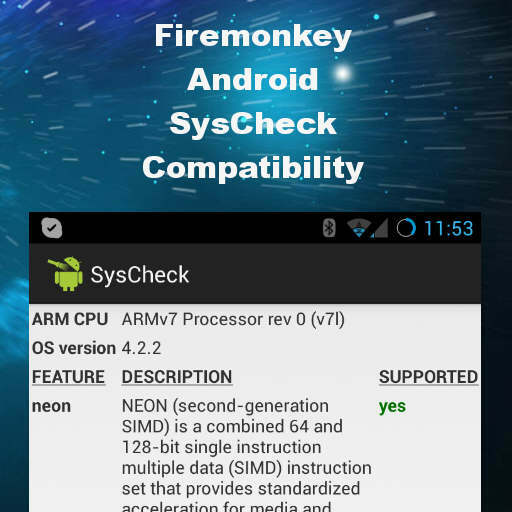 Head over and check out Jim’s blog post about the SysCheck compatibility app and then download it to your Android device to test it out.